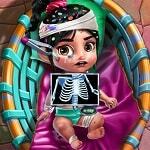 Baby Vanellope’s car crashed in a race and she needs a doctor right away! Go to the emergency room and have fun treating the cute baby. Learn how to use all the doctor tools. The X-Ray will show you all the broken bones, use it and then place casts on the right spots.